This time he used common equipment: A normal bike, a very long stem (Look Ergostem) and a Profile Aerobar (extended to its limits). Now his arms were stretched out, the hands about 30 cm before the front hub. (With a normal aero-bar setup the handlebar is mounted lower, and the hands are about 15-20 cm before the front hub). Because of this stretched out position, looking like Superman flying, it was called “Superman” position. The picture shos him in the jersey of “Olympia Dortmund” in the spring of 1995. At the world championships 1995 in Italy he won the title with a brilliant comeback beating Italy’s Andrea Colinelli. In 1996 his position was adapted by a lot of other riders. In the Atlanta Olympics both 4000 m single pursuit titles (men: Andrea Colinelli, women: Antonella Bellutti) were won with the superman position. The Italians used ITM handlebars with special front-ends. Colinelli improved Obrees record to 4:19. Obree himself was handicapped by a virus infection and failed to qualify with a disappointing time. At the world championships in Manchester Obree was still not in shape. But Chris Boardman, who participated in the Olympic road time trial (but not in the track events), made an unbelievable “comeback”. He had equipped his Lotus bike with a custom made “superman” handlebar and shocked the cycling world with a 4000 m world record of 4:11.114, beating Andrea Colinelli. The Italian pursuit squad, all riding in “Superman”-position, broke also the world record, almost reaching a time under 4 minutes. One week later Chris Boardman improved the hour record with the same bike he used at the world champs to 56.375 km/h. 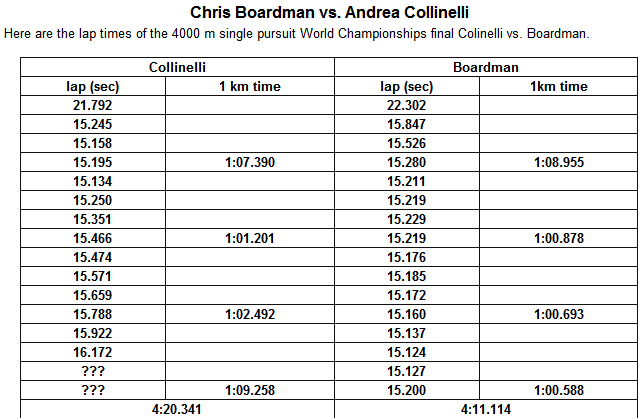 For the statistics look at Chris Boardman hour record page. Though Obree’s position was now established on the track, only few riders tested it on the road. At the time-trial world champs in Lugano was saw only one women (Italy’s ???) using it. In October the UCI created another new rule to ban an invention by Graeme Obree: The handlebar ist not allowed to extend the front hub for more than 15 cm. This effects of course the superman position, but also conventional setups (my triathlon bar extends the hub for 18 cm). But to make it really ridiculous, the UCI allowed a very big distance of 75 cm between the front hub and the bottom bracket. (A standard bike with 100 cm wheelbase would have a distance of around 60 cm). So one needed to lengthen the front part of the frame and still could get the superman position. Probably these bikes with a large wheelbase of ca. 115 cm would not handle very well, but for time trialing that shouldn’t matter. Only for tall riders these values were still not enough to get a full stretched-out position. At the end of october 1996 it still was unclear when the new rule would be official. 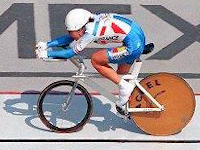 At the Nations Open in Paris-Bercy all riders still used Obree’s position, and Jeannie Longo broke the hour record for women with a superman setup. The Pinarello TT bikes of Bjarne Riis and Jan Ullrich were banned just before the Tour de France. When a fairing at the rear wheel was removed, Riis and Ullrich could use the bikes. As ar as I know no bike was banned because of the “superman” rule. The funny thing is that Jan Ullrich’s handlebar extends the front hub 18 cm! At the track world champiochips 1997 in Perth all riders used conventional setups. Though the inside track was probably as fast as the track in Manchester, the times increased roughly 1 second/km compared to the results from 1996. This demonstrated nicely the effectivity of the superman position. The UCI rules could finally be found at the UCI Site. You can download the PDF file there. Now they decreased the distance between the front hub and the bottom bracket to a maximum of 65 cm. For small riders there is still a change to reach a moderate superman position. This was valid just for 1999, since the rules changed again. In 1998 Graeme Obree planned to attack the hour record again. I found a picture at the Washing Machine Post showing him at the 1997 BCF TT Championship with a modified setup. It looks like his bike has a longer down tube than before, at least the handlebar is now quite small compared to the normal “superman” setup. As one can see, his “superman” position is not as good as with the old setup. Later in the year he gave up his plans saying that the new UCI rules did not allow to break the record. 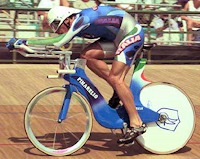 The UCI rules for the year 2000 put more constraints even to a normal aerodynamic positions, since the handlebar extensions “may not project beyond a point 10 cm in front of a vertical line passing through the front wheel spindle”. Especially for tall riders it is almost impossible to get a comfortable aero position – don’t even think of a superman position! This effects just the aerodynamic position. But there are new rules regarding the frame design, which effect to the whole bike industry severely, since only standard frame designs are allowed anymore. In 2001 the UCI had to modify their rules for tall riders.